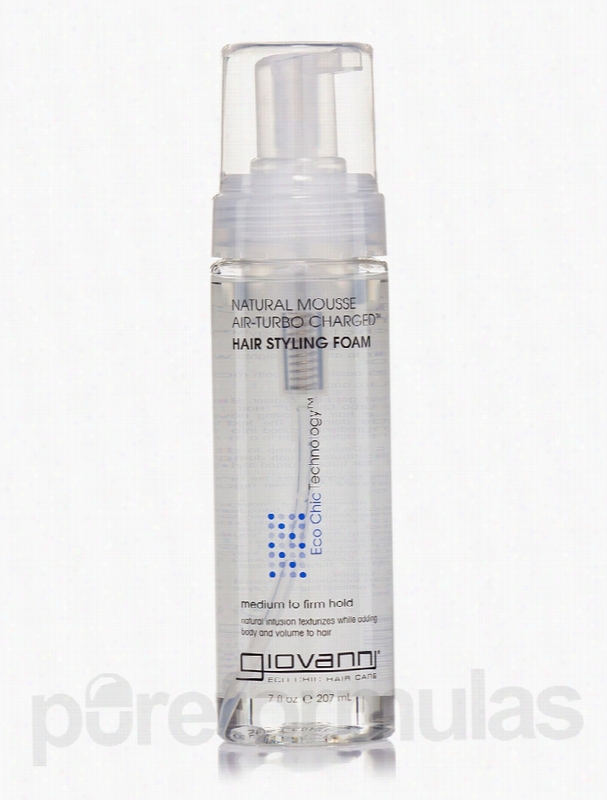 Giovanni Cosmetics Hair - Natural Mousse Hair Styling Foam - 7 fl. oz. Add smoothness&sbquo; luster&sbquo; and volume to your tresses with Natural Mousse Hair Styling Foam 7 fl. oz from Giovanni Cosmetics&reg;. This organic product is free from artificial fragrance&sbquo; dye&sbquo; paraben&sbquo; phthalate&sbquo; and sulfate. Aloe Vera leaf juice or Aloe Barbadensis reportedly nourishes your hair and controls frizz. It may add shine to your mane and make it more manageable. Sunflower seed oil and soybean seed extract could potentially soften your hair&sbquo; reduce damage and dryness&sbquo; and improve your hair&rsquo;s sheen and texture to support styling. Mallow&sbquo; lavender&sbquo; and rosemary extract in this hair styling foam from Giovanni Cosmetics&reg; helps maintain moisture balance in your hair to keep it soft and detangled. Thyme extract could potentially promote hair growth and make your hair shinier and healthier. Chamomille Recutita flower extract reportedly nourishes hair and infuses life to dull looking mane. The presence of vitamin E and extracts of Betula Alba&sbquo; Achillea Millefolium&sbquo; cetyl&sbquo; nettle&sbquo; and coltsfoot in Natural Mousse Hair Styling Foam 7 fl. oz from Giovanni Cosmetics&reg; may add life&sbquo; sheen&sbquo; moisture&sbquo; and texture to your lovely locks to make hair styling easy. These statements have not been evaluated by the Food and Drug Administration (FDA). These Products are not meant to diagnoseÃ¢ÂÂ treat or cure any disease or medical condition. Please consult your doctor before starting any exercise or nutritional supplement program or before using these or any product during pregnancy or if you have a serious medical condition. 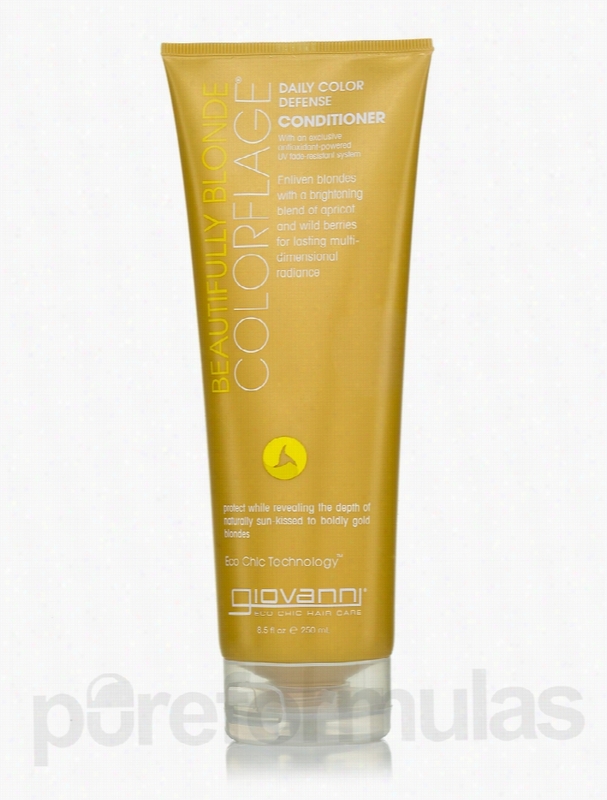 Giovanni Cosmetics Hair - ColorFlage Beautiful Blond Conditioner - 8.5. Light up the day and night&sbquo; beautifully.Beautifully Blonde ColorFlage&reg; Conditioner illuminates blondes&sbquo; bringing gold to the surface as it treats hair so silky shine. A brilliant-berry-cocktail of Apricot and restorative Wild Rose berry combine with other powerful conditioning ingredients to dazzle by day and light with radiant health.Protect. condition. Defend. Renew.Product Highlights:1. Protect: Exclusive UV fade-resistant system shield&sbquo; hair&sbquo; maintaining color vibrancy and integrity.2. Conditioning: Nourishing&sbquo; antioxidant-powered conditioners shield against color wash-out.3. Defend: Exclusive color-lockers rebuild strength in rough&sbquo; porous hair to make hair 'new'.Eco Chic Technology: The elements of earth&sbquo; wind&sbquo; fire and water represent a unique combination of certified organic botanicals and incredible style. These statements have not been evaluated by the Food and Drug Administration (FDA). These Products are not meant to diagnoseÃ¢ÂÂ treat or cure any disease or medical condition. Please consult your doctor before starting any exercise or nutritional supplement program or before using these or any product during pregnancy or if you have a serious medical condition. 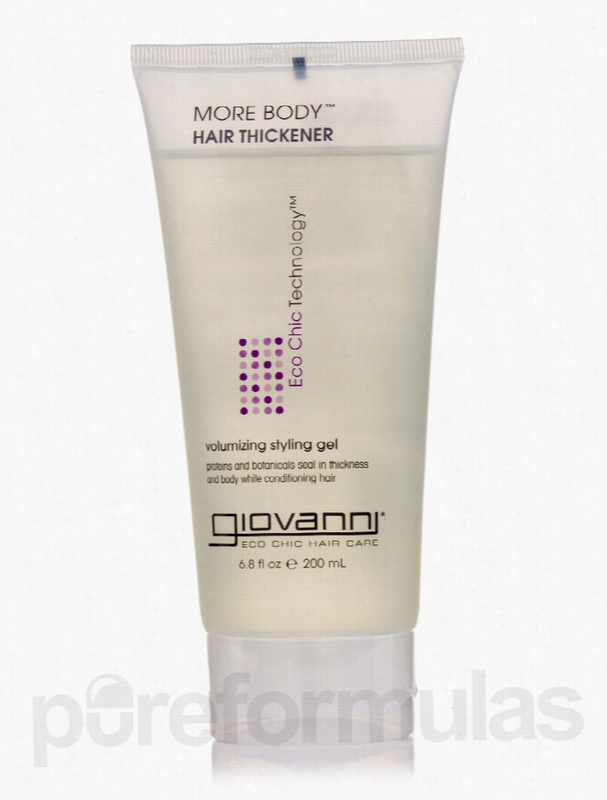 Giovanni Cosmetics Hair - More Body Hair Thickener & Styling Gel - 6.8. Volumizing styling hair. Proteins and botanicals seal in thickness and Body while conditioning hair.More Body&trade; Hair Thickener with Eco Chic Technology&trade;*Thin hair needs thickness. A thickness you can see and feel&sbquo; with split ends ready to seal. More Body Hair Thickness lives up to every part of its name. Work this slippery gel through hair and feel the difference. hair becomes fat and thick. Suddenly you have more body exactly where you need it&sbquo; when you want it. So style. With this gel&sbquo; you're always in the thick of it.Product Highlights:1. Seals split ends after infusing thickness.2. Pumps up the volume with tremendous shine.3. Adds condition&sbquo; style and more body. *The elements of earth&sbquo; wind&sbquo; fire&sbquo; and water represent a unique combination of certified organic botanicals and incredible style. These statements have not been evaluated by the Food and Drug Administration (FDA). These products are not meant to diagnoseÃ¢ÂÂ treat or cure any disease or medical condition. Please consult your doctor before starting any exercise or nutritional supplement program or before using these or any product during pregnancy or if you have a serious medical condition. 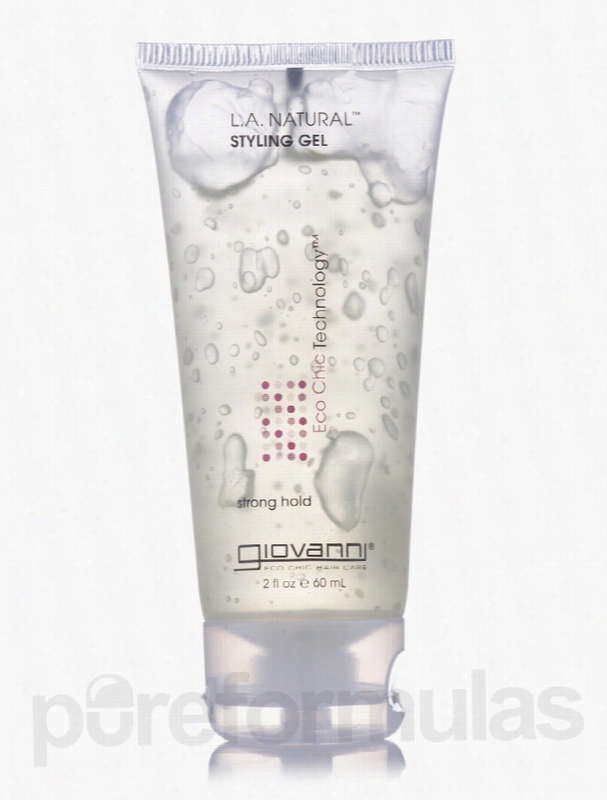 Giovanni Cosmetics Hair - L.A. Natural Styling Gel - 2 fl. oz (60 ml). This controlling gel takes hold to the extreme. Its natural-base includes extraordinary ingredients that grab onto style and hold on tight. With this strong holding gel&sbquo; you can stand firm in the spotlight.Product Highlights:1. Secures shape with extreme hold.2. Shines brilliantly with surface enhancers.3. Controls frizz with authority. *The elements of earth&sbquo; wind&sbquo; fire&sbquo; and water represent a unique combination of certified organic represent a combination of certified organic botanicals and incredible style. These statements have not been evaluated by the Food and Drug Administration (FDA). These Products are not meant to diagnoseÃ¢ÂÂ treat or cure any disease or medical condition. Please consult your doctor before starting any exercise or nutritional supplement program or before using these or any product during pregnancy or if you have a serious medical condition. Giovanni Cosmetics Skin Care - Flight Attendant First Class Travel. Smooth&sbquo; Silky&sbquo; Youthful and Luminous. This is your face&reg;.Out with the bad: Volcanic Ash and activated Charcoal work to extract impurities without drying skin.In with the good: Super Antioxidants Acai and Goji Berry help recharge and rejuvenate facial cells&sbquo; while Green tea and Fig&sbquo; combined with high-performance hydrators make skin feel soft&sbquo; alive and restored. These statements have not been evaluated by the Food and Drug Administration (FDA). These products are not meant to diagnoseÃ¢ÂÂ treat or cure any disease or medical condition. Please consult your doctor before starting any exercise or Nutritional supplement program or before using these or any product during pregnancy or if you have a serious medical condition. Giovanni Cosmetics Bath and Body - Hydrate Body Lotion Cucumber Song -. HYDRATE&trade; Illuminating body lotion has the light scent of cucumber melon and contains uniquely soothing ingredients that smooth across skin to infuse needed moisture and hydration. These statements have not been evaluated by the Food and Drug Administration (FDA). These Products are not meant to diagnoseÃ¢ÂÂ treat or cure any disease or medical condition. Please consult your doctor before starting any exercise or nutritional supplement program or before using these or any product during pregnancy or if you have a serious medical condition. 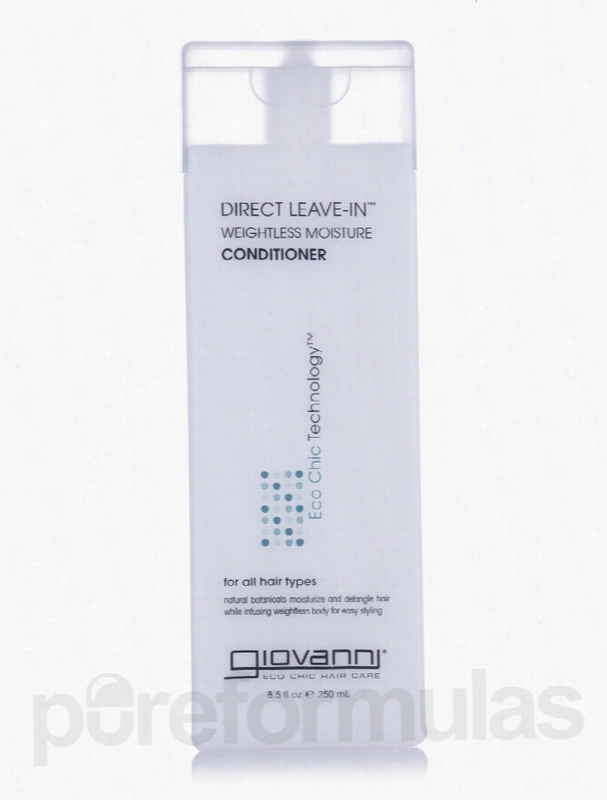 Giovanni Cosmetics Hair - Direct Leave-In Conditioner - 8.5 fl. oz. To create condition and style&sbquo; you need to go directly to the source. Direct Leave-In Weightless Moisture Conditioner penetrates into each individual hair to provide exactly what's needed&sbquo; every time. This leave-in treatment uses enriched proteins to repair hair so it feels thicker&sbquo; more bodified. Styled. Weightlessly. By infusing each strand with proteins&sbquo; hair goes directly to style.Product highlights:1. Restores strength&sbquo; luster and nourishment to abused hair.2. Moisturizes and builds body.3. Detangles for easy comb-out&sbquo; easy Styling. *The elements of earth&sbquo; wind&sbquo; fire and water represent a unique combination of certified organic botanicals and incredible style. These statements have not been evaluated by the Food and Drug Administration (FDA). These products are not meant to diagnoseÃ¢ÂÂ treat or cure any disease or medical condition. Please consult your doctor before starting any exercise or nutritional supplement program or before using these or any product during pregnancy or if you have a serious medical condition. 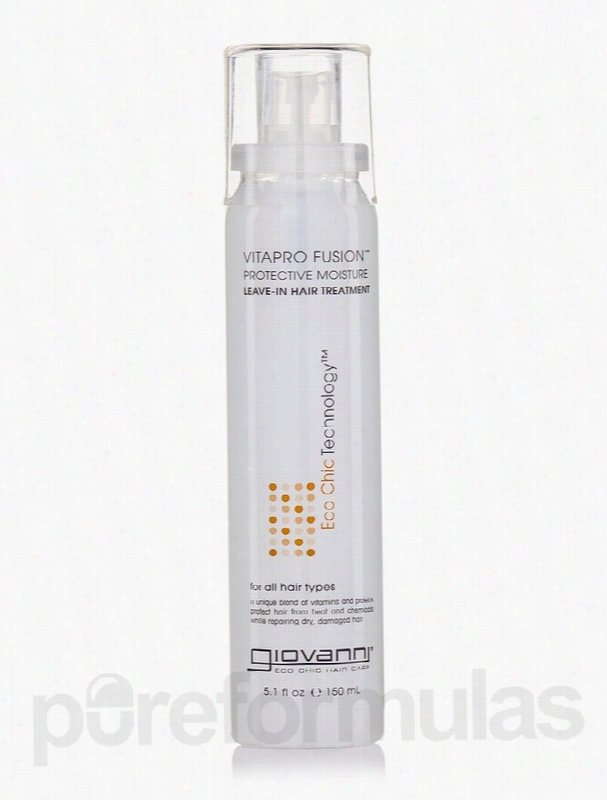 Giovanni Cosmetics Hair - Vitapro Fusion - 5.1 fl. oz (150 ml). Vitapro Fusion&trade; Protective Moisture Leave-in hair treatment with Eco Chic Technology&trade;*.Vitamins aren't just good for your Body. They're also good for your hair. When combined with protein&sbquo; the result is stronger&sbquo; healthier&sbquo; shinier hair. Vitapro Fusion fuses together the best parts of vitamins with the essential elements in protein to create soft manageable&sbquo; beautiful hair. Professional hair. What a treat.Product Highlights:1. Penetrates damaged hair to rebuild and repair.2. Infuses hair with protein-enriched botanicals.3. Protects hair from heat&sbquo; chemicals and bad days. *The elements of earth&sbquo; wind&sbquo; fire and water represent a unique combination of certified organic botanicals and incredible style. These statements have not been evaluated by the Food and Drug Administration (FDA). These products are not meant to diagnoseÃ¢ÂÂ treat or cure any disease or medical condition. Please consult your doctor before starting any exercise or nutritional supplement program or before using these or any product during pregnancy or if you have a serious medical condition. 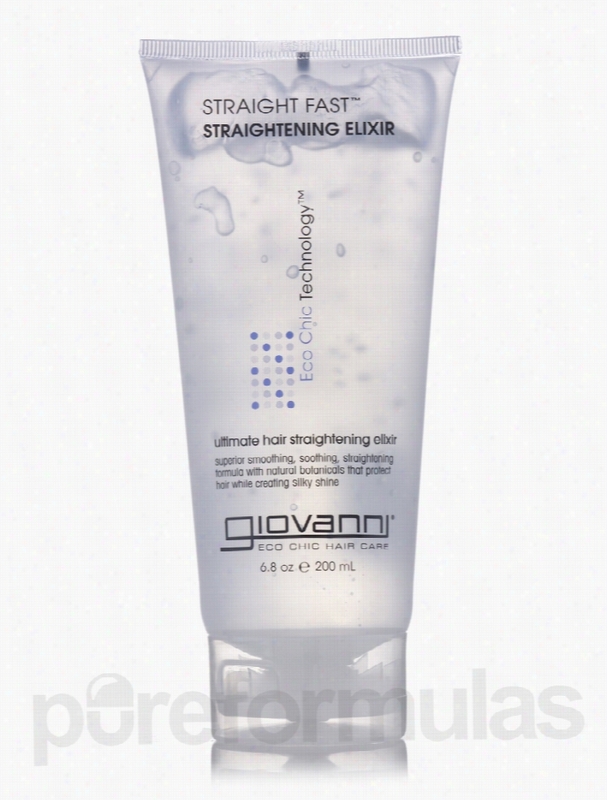 Giovanni Cosmetics Hair - Straight Fast Hair Elixir - 6.8 fl. oz (200. Straight Fast&trade; Straightening Elixir.Smooth the curls&sbquo; relax the waves&sbquo; control the unruliest hair. 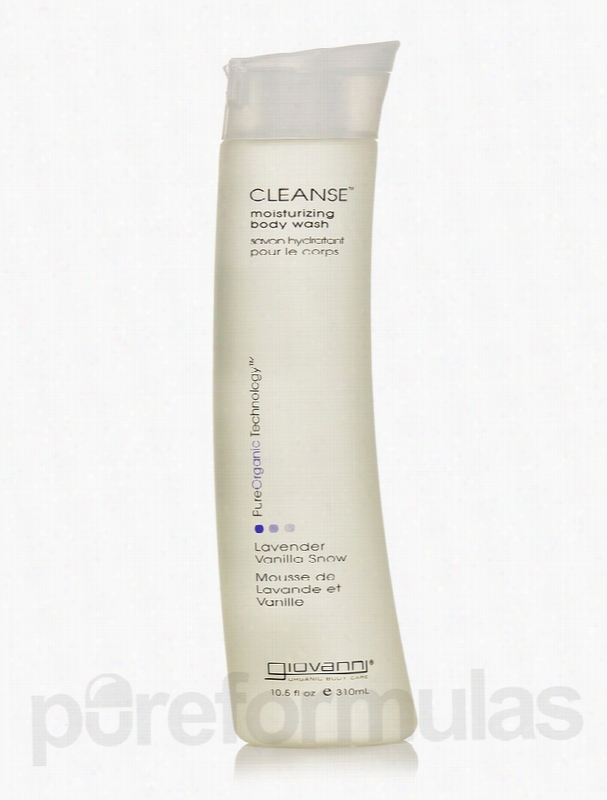 This lightweight crystal clear gel&sbquo; adds silky shine while it repels humidity. Your hair is sleek and stays totally touchable. Perfect for all hair types.Product Highlights:1. Smoothes and soothes hair for the ultimate sleek style.2. Straightens hair temporarily until your next shampoo.3. Certified organic botanicals protect hair from heat styling. * The elements of earth&sbquo; wind&sbquo; fire and water represent a unique combination of certified organic botanicals and incredible. style. These statements have not been evaluated by the Food and Drug Administration (FDA). These Products are not meant to diagnoseÃ¢ÂÂ treat or cure any disease or medical condition. Please consult your doctor before starting any exercise or nutritional supplement program or before using these or any product during pregnancy or if you have a serious medical condition.